I wanted to share what I did with my bowtie winnings. 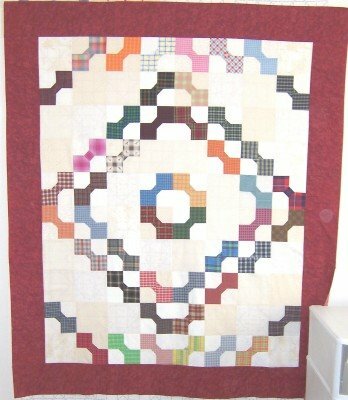 First I had all the blocks sewn together on point with a plain block in between and decided I didn’t like the setting. Yesterday I ripped the whole quilt top apart, started over and got the borders on it this morning. I didn’t notice until I was taking the picture that I forgot to add the navy blue inner border! After all the work I did and ripping I decided I wasn’t going to rip the borders off just to add the inner border. I’m sure my nephew will never know the difference. Now to get it sandwiched and quilted.